For a quick and healthy weeknight dinner, wild caught salmon is an excellent choice. 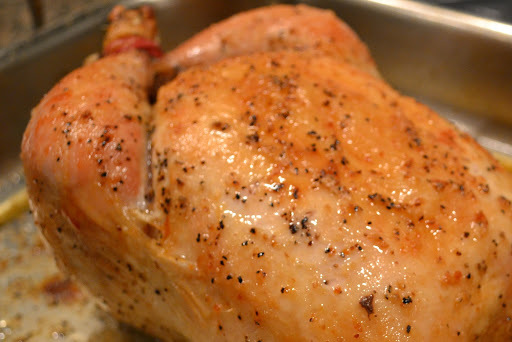 Using this recipe from Simply Recipes for inspiration, I added some fresh dill and substituted olive oil for the butter. 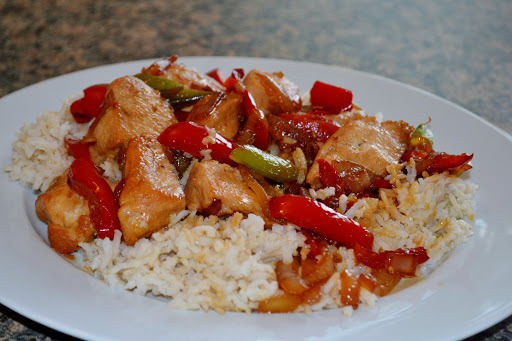 It was done in 30 minutes and tasted delish served over rice! 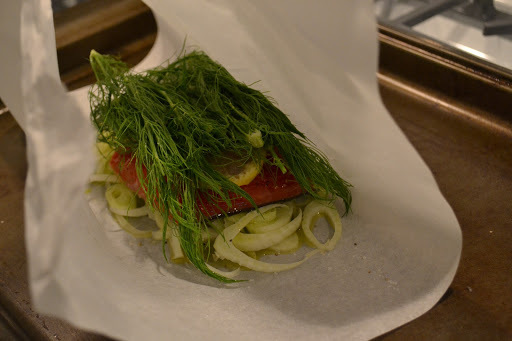 On a large piece of parchment paper, I placed the sliced fennel down first, followed by the salmon (skin side down). I seasoned the fish liberally with kosher salt and black pepper and then drizzled the whole thing with olive oil. 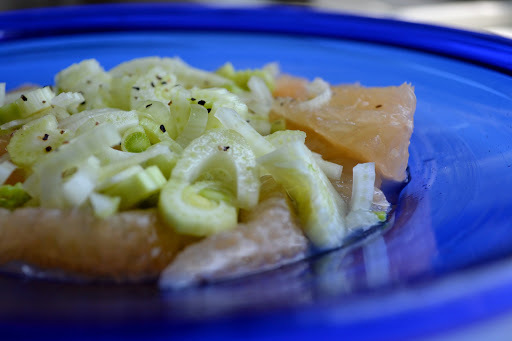 I topped it off with lemon slices and then put a big bunch of fennel fronds on top. I wrapped up the whole package in parchment and sealed the edges to keep in the steam before throwing it in the oven on a cookie sheet. 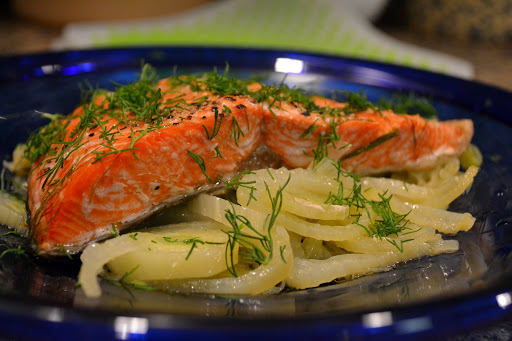 Before serving, I removed the fennel fronds – they were only there to infuse flavor into the fish – and sprinkled liberally with fresh chopped dill. 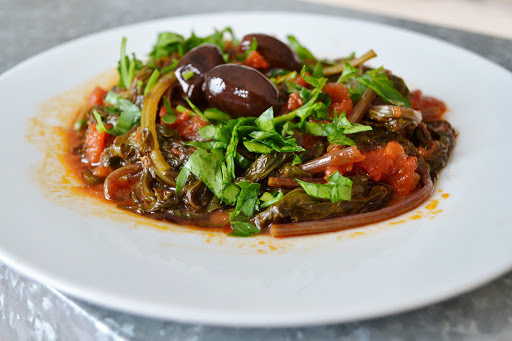 This might be my favorite way to cook fennel yet! It was sweet and tender and lemony all at once. 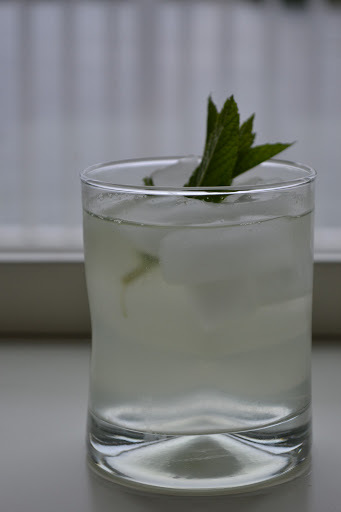 The perfect accompaniment to salmon. Yum! 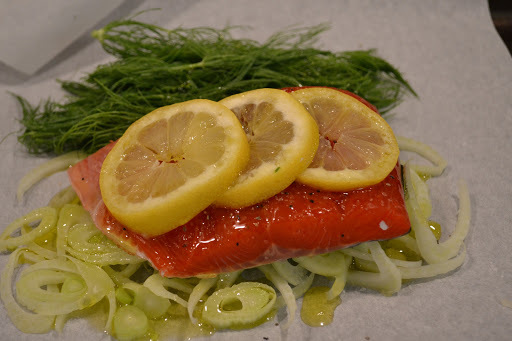 This entry was posted in Appleton Farms CSA, csa week 3, dill, fennel, fennel fronds, Main Dishes, salmon and fennel in parchment on June 30, 2013 by Megan. I’m excited to have fresh dill this week! I love its bright flavor sprinkled over all kinds of things. We also got beets, which I must confess, are not my favorite. I’ve had to come up with some creative ways to use them since they show up in the share pretty consistently throughout the season. I will definitely be posting some of my ideas. 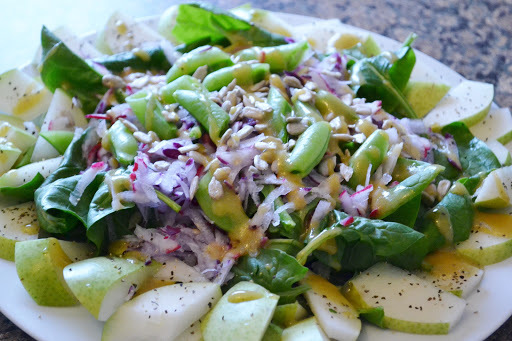 This entry was posted in Appleton Farms CSA on June 26, 2013 by Megan. We in the Northeast are on day three of a heat wave. When it’s super-hot outside, I crave fresh, light meals. This was the perfect cooling lunch for a sweltering day! 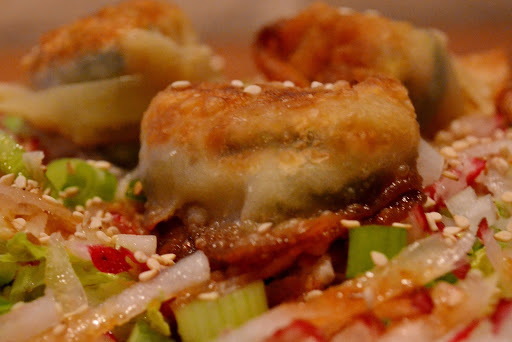 This was my first time using store-bought wonton wraps. I’m a big fan! These were easy to put together and came out crispy, crunchy and delicious! You can serve these on their own with a little dipping sauce (I used Trader Joe’s sweet chili sauce), and/or place them on top of Napa cabbage slaw (recipe below). 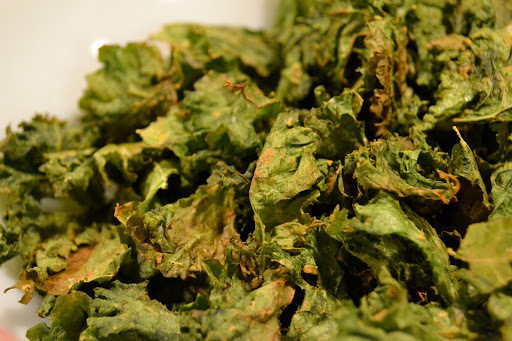 Adapted from Chef Douglas MicNish’s Sour Cream and Onion Kale Chips. These came out very crispy but the chive flavor was kind of subtle. Next time I might try blending the lemon juice, nutritional yeast, sea salt, garlic powder, chives and olive oil in a food processor to ensure that the chive flavor will really stick to the kale. bake for 5-10 minutes, checking frequently until the chips are very dry and crisp *watch carefully – the chips will turn from the perfect crisp to scorched in seconds! This entry was posted in Appleton Farms CSA, fennel and grapefruit salad, vegan "sour cream" and chive kale chips, vegan potstickers, vegetable potstickers on June 25, 2013 by Megan. 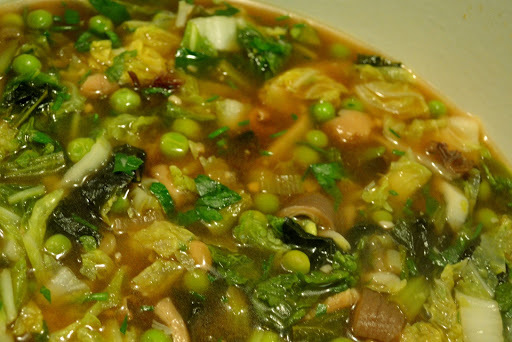 I used up the Napa cabbage, the baby red bok choy, the scallions and some parsley, chives, and freshly shelled peas in a soup. It turned out OK but not great. I’m going to skip the recipe since it wasn’t my best work. I have used Napa cabbage in soups before and had success. It’s really delicious when sliced thin to resemble noodles – just make sure to pair it with a flavorful broth. 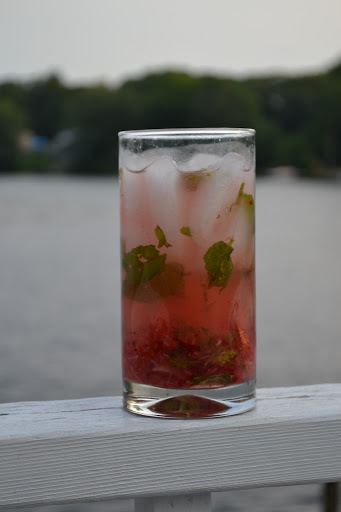 This entry was posted in Appleton Farms CSA, Beverages, Kale Piccata, Main Dishes, Soups, Chowders & Stews, strawberry mint cooler on June 23, 2013 by Megan. It’s still pretty early in our growing season, so we’re getting mostly greens right now. 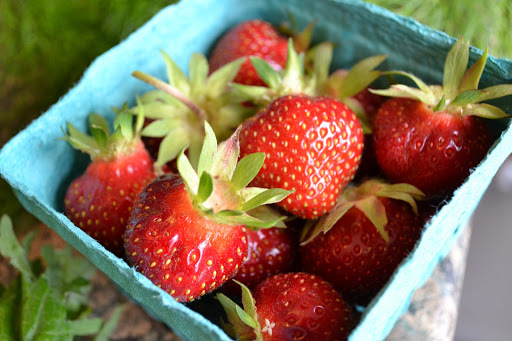 I love my kale, but the really fun part of June is the strawberries! They are so much sweeter and juicier than the store-bought kind. 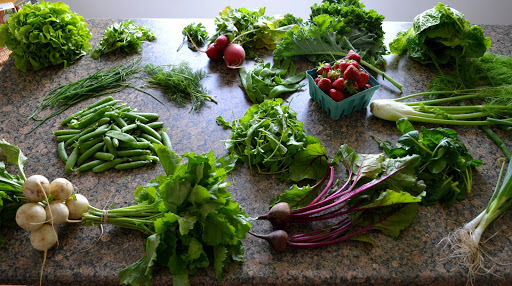 This entry was posted in Appleton Farms CSA, arugula, bok choy, CSA week 2, herbs, kale, kohlrabi, lettuce, napa cabbage, radishes, russian red kale, scallions, shelling peas, strawberries on June 18, 2013 by Megan. 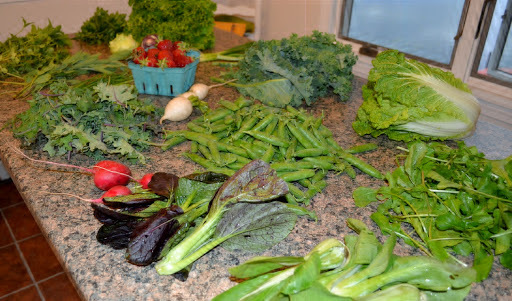 Just finished up using my farm share from week one with the exception of one bulb of fennel and some braising greens. Luckily they’ll still be fresh next week; one of the best things about a local CSA is how long the produce lasts. Grocery store produce usually has a long trip from wherever it was grown before it even makes it to your shopping cart. Shopping at a local farm means your veggies just came out of the ground and will last longer in the fridge! All ingredients in bold are from the CSA. 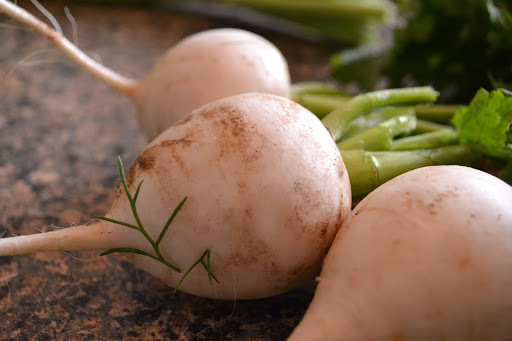 These young turnips are mild enough to use raw. In a large pot of salted water, cook the fettuccine until just firm. Remove the pasta and set it aside. Let the pasta water remain boiling on the stove. In a large skillet, saute the shrimp in a little bit of olive oil until just cooked. Season with salt and pepper and set aside on a plate. Do not overcook – it only takes a minute or two on each side – use tongs to flip. 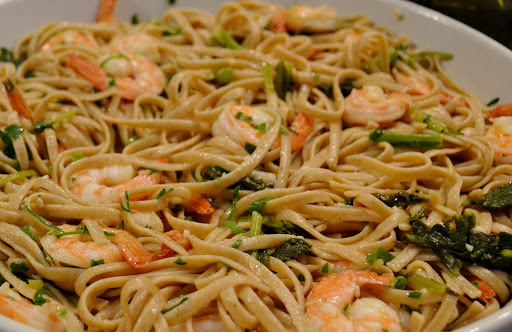 While the shrimp is cooking, blanch the broccoli rabe in the pasta water until tender-crisp. Add the garlic and about half the lemon juice to the skillet that the shrimp just came out of. Allow the garlic to cook for a minute or two, reducing the heat if necessary. Using a skimmer or slotted spoon, fish the broccoli rabe out of the boiling water and add it to the skillet. Dump the pasta and the shrimp into the skillet along with a spoonful of pasta water, the rest of the lemon juice, and the fresh parsley. Season with salt and pepper. Dump everything into a large pasta bowl and mix well before serving. This one’s so easy, there’s no recipe required. Just stuff some fresh herbs (I used sage, parsley and oregano) into the cavity of a small chicken and rub the skin with salt, pepper and olive oil before roasting. This entry was posted in appleton csa, fettuccine with lemon-garlic shrimp and broccoli rabe, herb roasted chicken, lemon-oregano dressing, Main Dishes, red romaine and arugula salad with baby turnips, salad turnips, Salads on June 16, 2013 by Megan. Cooking with a farm share is super fun because it requires creativity and spontaneity. You never know what awaits you in the share room, so you can’t exactly plan out recipes in advance. Once I pick out my share and get it home, I like to take stock and figure out how to make it work with whatever I already have on hand. This usually results in the kind of cooking where you don’t follow a recipe. You just make it up as you go. Sometimes the result is yummy and other times it’s not so great, but it’s ALWAYS fun! Here’s what I’ve done so far with this week’s share. Items from the CSA are in bold letters. 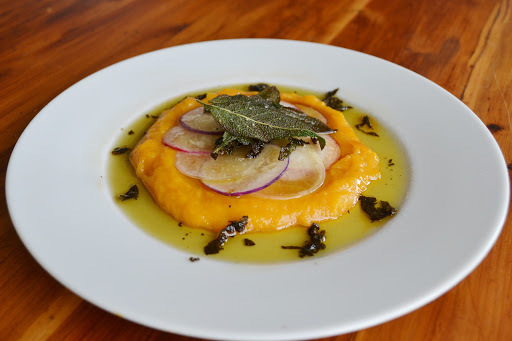 If you love homemade butternut squash ravioli with sage brown butter sauce, this recipe is for you! All the flavor with none of the guilt. 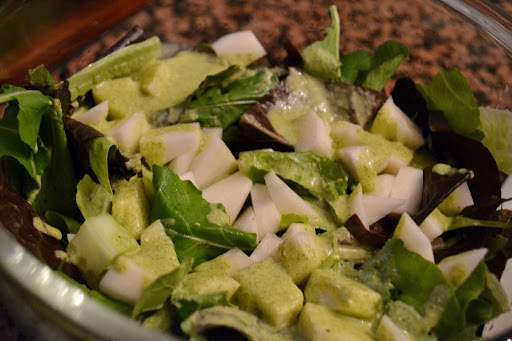 Fresh and light, it is packed with nutrients that you can feel good about. This recipe makes enough for 2 entree-sized portions or 4-6 small plates for an elegant first course. 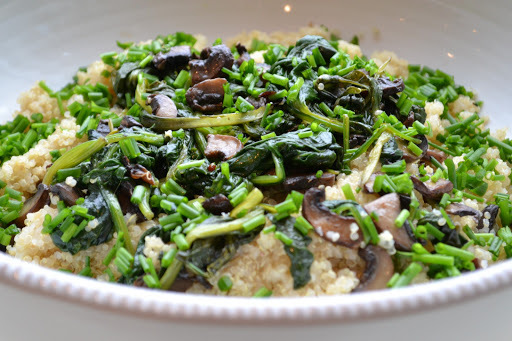 This is a DELICIOUS way to eat your greens. 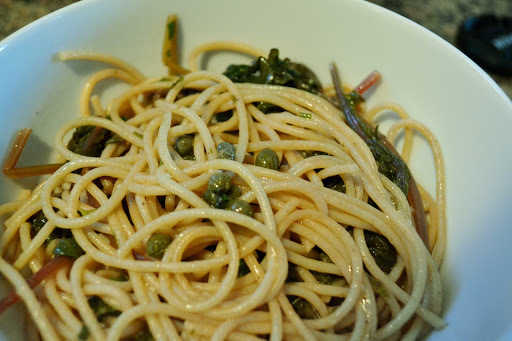 It reminds me of pasta puttanesca, without the heavy pasta. Since this was a baby Russian Red Kale, I used the whole leaf. If you are using a mature kale, you’ll need to take out the tough stalks and cut up the leaves into smaller pieces before cooking. All varieties work well in this dish if you make sure to simmer until tender. For Brad, who is more of a meat and potatoes kind of guy, I used some sugar snap peas in a basic chicken stir fry with veggies. These beautiful fresh strawberries were eaten exactly as-is. Yum! This entry was posted in Appetizers & Snacks, Appleton Farms CSA, Beverages, chives, easter egg radish, kalamata olives, kiwi, Main Dishes, mint, parsley, pears, quinoa, russian red kale, sage, Salads, scallions, Side Dishes, spinach, sugar snap peas, sweet potato, tat soi on June 12, 2013 by Megan.